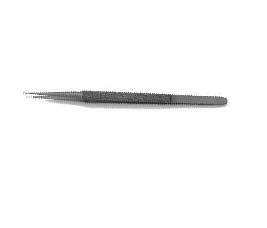 Titanium Dissecting Micro Tying Forceps w/ Ring Tips MRImed.com is the leading supplier for MRI medical equipment and supplies. Titanium Dissecting Micro Tying Forceps w/ Ring Tips, O int 13/10, O ext. 19/10 150mm - 6"
Titanium Dissecting Micro Tying Forceps w/ Ring Tips, O int 13/10, ext. 19/10 180mm - 7 1/8"
Titanium Dissecting Micro Tying Forceps w/ Ring Tips, O int 10/10, O ext. 20/10 220mm - 8 5/8"
Titanium Dissecting Micro Tying Forceps w/ Ring Tips, O int 4/10, O ext. 10/10 180mm - 7 1/8"
Titanium Dissecting Micro Tying Forceps w/ Ring Tips, O int 4/10, O ext. 10/10 220mm - 8 5/8"